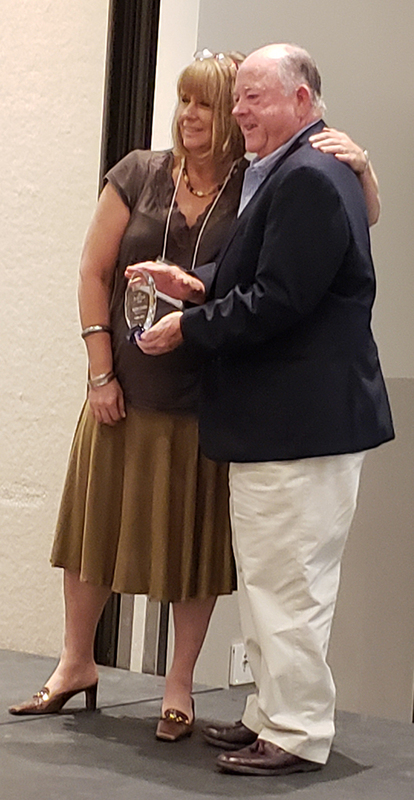 ST. GEORGE — A St. George man who became deeply involved as a volunteer in the mental health field when his daughter was diagnosed as bipolar has been honored for his work by the National Alliance on Mental Illness at the organization’s annual conference in Salt Lake City. Wayne Connors was presented with the Vicki Cottrell Award last month for his eight years of dedication to the NAMI program in southwest Utah. The award is annually given to one person who has dedicated a significant amount of time, effort and commitment to the program and the individuals they serve. NAMI is one of the nation’s largest mental health organizations, providing education and support for individuals with mental illness and their families. NAMI Utah Southwest offers both peer-to-peer and family-to-family support groups led by people who have either dealt with their own mental illness or who have supported a family member. While individuals with mental health conditions usually need medication to help restore the chemical balance in their brain, NAMI provides the support groups for people to learn about what mental illness is and how to live with it, which Connors said is as essential as medication. Connors and his wife, Pam Connors, first became involved with NAMI when their daughter was diagnosed with bipolar disorder. After attending the class, the couple decided they wanted to give back and help others who were going through what they had. The Connors started out teaching family-to-family classes before moving into leadership positions within NAMI Utah Southwest. Wayne Connors was the program’s president for five years and is now treasurer and head of the steering committee, overseeing communication efforts and acting as liaison between NAMI Utah Southwest and the NAMI group at Dixie State University. Pam Connors is the program director, coordinating locations, teachers and schedules. The couple works around 15-30 hours to keep up with their responsibilities. “It’s a very fulfilling position and sometimes we learn more than what we teach. It really helps us as much, or more, as some of our people in classes, the people that we help,” Pam Connors said. Wayne Connors said he was honored to receive the Vicki Cottrell Award because of the impact that Cottrell had on the program. Cottrell was a NAMI advocate who helped create programs including Hope for Tomorrow, the Crisis Intervention Team and family-to-family classes. She was killed in 2005 in a car crash on her way to a NAMI meeting. “Just her way of life, she backed it and believed in it, and had passion about it and just inspired people to do things, to follow-up and get things done,” Wayne Connors said. The Connors work to spread awareness of the program and to continuously reach out to those who have taken their courses, update students and affiliates with information about new research and legislation, and continue training staff and learning new ways to improve. Mind Matters: This is why NAMI groups can be a powerful help with mental illnesses: The volunteers have lived it.